» oBike, Mobike, Ofo, Urbo: why are so many new cycle hire services launching in London? oBike, Mobike, Ofo, Urbo: why are so many new cycle hire services launching in London? Back in July, hundreds of yellow bikes appeared overnight on the streets of London. Singaporean start-up oBike made 400 cycles available for ‘dockless’ hire, aiming to undercut TfL’s Santander Cycles. But after a couple of days the bikes were seen littering pavements across London, hanging from railings, dumped in the Thames and marooned on an island in Victoria Park. oDear. oBike isn’t the only new bike hire service in town, though. Shortly after its launch, another company – Chinese start-up Mobike – made 750 red bikes available for hire in Ealing. 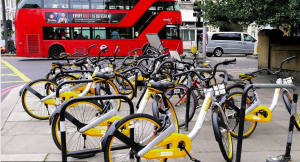 Now two further schemes have launched: another Chinese company called Ofo, which launched 200 yellow bikes in Hackney yesterday, and the Irish company Urbo, which has made 250 green dockless bikes available in Waltham Forest from today. What’s going on? Why are all these new ‘dockless’ schemes pitching up in London at the same time?